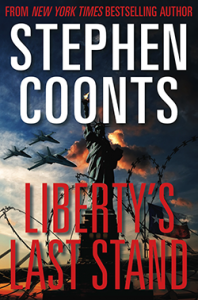 In Liberty’s L ast Stand, a superb new novel by bestselling author Stephen Coonts, a series of Islamic jihadist terrorism attacks on American soil prompts the U.S. president to declare martial law, suspend Congress, sideline the Supreme Court, and start rounding up his political enemies. Texans refuse to go along with the president’s heavy-handed violations of the Constitution and secede from the Union. Soon, all-out war erupts between factions loyal to the president and those committed to freedom, led by gutsy Texans. Steve Coonts is a master storyteller, but his latest political thriller should be read and absorbed as sobering prediction, not dismissed as mere fictional entertainment. Such a scenario easily could unfold over the next few months. Given the predilections of today’s imperious Washington elites, the potential for politically driven overreaching is a real and present danger. Any unusual event or crisis—manmade or natural—could become an excuse for once-unimaginable power grabs. Suspension of national elections; freezes on bank accounts; closings of airports, rail lines and interstate highways to limit citizen movements; food, water and energy rationing; termination of all gun and ammunition sales, and nationalization of critical industries, for example, could already be in some diabolical plan. Any or all of these “emergency measures” would be imposed for unassailable reasons, of course. Citizen protection, preservation of critical resources, first-responder safety or anything “for the greater good” would be cited. Don’t be surprised if constitutionally guaranteed rights are suspended indefinitely, including First Amendment provisions to question Washington’s edicts. Free speech and other rights easily could be set aside, and any who dare to challenge government’s sweeping actions could find themselves behind bars in special camps—just as the president’s opponents were in Coonts’s novel. At some point, Beltway tyrants most definitely would abolish the Constitution’s Second Amendment, the hallowed guarantee that citizens’ right to bear arms shall not be infringed. Gun control activists could never resist capitalizing on a superb opportunity to finally disarm Americans. But therein lies the Achilles heel of would-be despots’ overreach and miscalculation. They blindly, willingly fail to comprehend the depth of Americans’ iron-clad determination. Millions will never comply with orders to turn in privately owned firearms, because true patriots know gun-control’s sordid history. Every successful dictator has disarmed the populace, before imposing his will on citizens who then had no meaningful way to resist. Washington’s elites are grossly out of touch with those they purport to serve. They naively believe that simply ordering every law enforcement agent in the country to go door-to-door and confiscate firearms, for example, would quickly render America a nationwide “gun-free zone.” It won’t happen. Look at the abject failure of recent thinly veiled gun-confiscation schemes legislatures and governors tried to ram through in New York and Connecticut. Citizen noncompliance ran as high as 95 percent, despite shrill threats from on high. But such abject failures won’t stop arrogant elected officials and rabid bureaucrats from ordering federal, state and local officers to go forth and seize taxpayers’ guns and ammunition, during a “national crisis.” Smart federal agents, marshals, sheriffs, deputies and patrol officers will refuse to enforce what they know are unconstitutional dictates. Not-so-smart cops will do as their superiors order, claiming they’re just doing their job. The decision should be easy. Public servants—from the president, senators and congressional representatives to every person in a military or law enforcement uniform—took a solemn oath to protect and defend the Constitution against all enemies, foreign and domestic. Officers who believe they’re just doing their job by invading private homes to confiscate food, water, weapons and ammunition “for the greater good of all,” because some slick-talking elected official or powerful bureaucrat ordered them to do so, will be sacrificing both honor and life for nothing. Driveways and streets across America will be littered with the bodies of cops who attempted to enforce unlawful dictums designed to leave citizens defenseless and starving. Can’t happen here, you say, officer? For decades, Americans have been programmed and emasculated by asinine levels of political correctness, ensuring they will knuckle under, you think? Nobody will fight back? Yes, aggressive, egotistic cops who abuse, brutalize and kill, then lie and cover up their crimes, are rarely held accountable these days. True, badged ones have hammered the point home time and again: Comply or die. Consequently, “No worries,” not-too-bright agents and cops may conclude. Americans will meekly turn in their guns and every round of ammunition. Any officer who accepts such nonsense—and there are far too many of their ilk among today’s roughly 900,000 sworn law enforcement agents—should look up the Battle of Athens, Tennessee. In 1946, battle-hardened GIs who had just returned from World War II took up arms against a corrupt sheriff and his roughly 200 “deputies”, who tried to intimidate voters and steal a county election—as they had for years. The GIs didn’t hesitate to fire on the corrupt thugs, forcing them to surrender and allow the election to proceed unhindered. “The Battle of Athens clearly shows how Americans can and should lawfully use armed force…why the rule of law requires unrestricted access to firearms, and how civilians with military-type firearms can beat the forces of government gone bad,” explained David Codrea in a Guns & Ammo article (October 1995). Fears of onerous gun controls being imposed by the federal government have doubled private firearm sales, since President Barack Obama took office in 2009. By the end of 2016, an estimated 405 million firearms will be in the hands of private citizens, many of whom are willing to take on government agents trying to enforce illegal measures imposed by Washington. If only 10 percent of those guns are used to counter government-mandated invasions, cops would be outnumbered forty-to-one. Every police officer would be well-advised to stand by his or her sworn oath and refuse to enforce some would-be tyrant’s mandates, no matter how nicely they’re packaged. Decide now, officers, not when Washington is ordering you to violate that oath, falsely claiming you’ve sworn allegiance to a person or government. You’ll sleep better…and live longer.